August saw the season end of all the volunteers for the Isle of Eigg Heritage Trust and the Scottish Wildlife Trust. 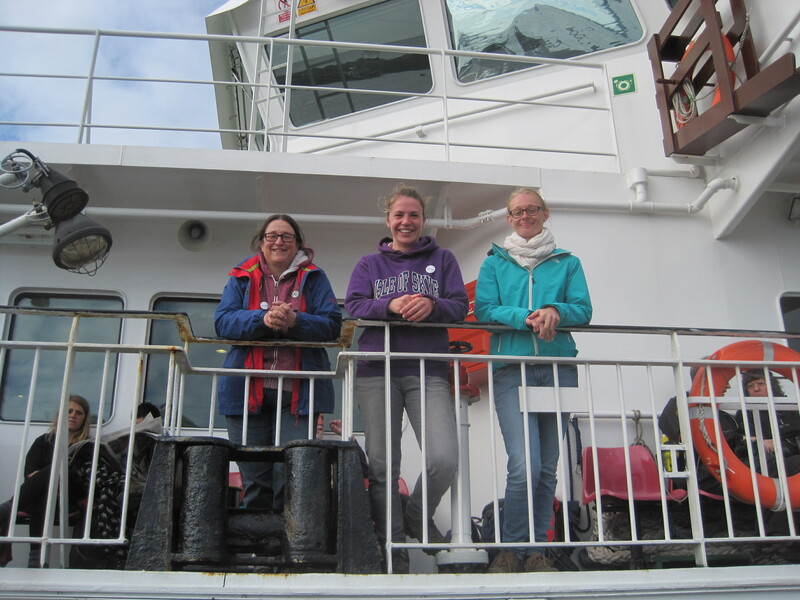 On the 31st of August we waved a fond farewell to the remaining 4, only 3 in the photo as one left on a different ferry just to avoid a photo! It is always sad to see the volunteer season come to a close as volunteers add so much to our wee community and a reminder winter is looming! Not only does a whole load of tasks get done but the addition of six new faces makes quite an impact socially and always interesting where everyone comes from and each person usually has a fairly unique story on how they came to be on Eigg. In 2015 volunteer season we had 11 SWT volunteers, 18 IEHT volunteers, 6 IEHT conservation holiday volunteers. There was also 18 volunteers for other organisations on the island plus a further 4 summer workers. That is a grand total of 53 volunteers from April to September! Hopefully 2016 will be just as successful, next years application forms have now been updated and available for download.